Tawang and Bum-La Pass, a tourist destination along Sino-India border in Tawang district of Arunachal Pradesh on Sunday witness 1st snowfall of the season which is being enjoyed by the tourists visiting the district as well as the local residents. The Bum-La Pass is located at an altitude of 15,200 ft above sea level and is around 37 km away from the district headquarter Tawang. 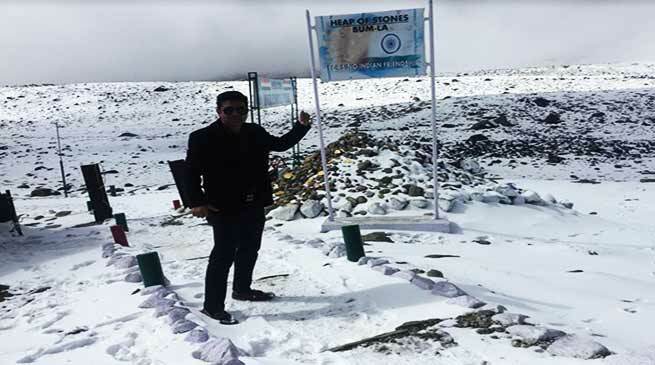 Tawang SP Sagar Singh Kalsi while talking to Arunachal24 said that on November 3rd, some parts of the district experienced from Tawang city towards Bumla Pass witnessed snowfall. From October onwards till early December is the peak time for tourists to visit Tawang, he added. Now that, given the snowfall and cold weather, the tourists are advised to take all the precautions relating to the same. They are advised to avoid journey before sunrise or after sunset to save inconvenience and accidents. Also, the vehicles be equipped with all gears and accessories related to travel in the snow as well as proper medication etc. Travelling in groups is recommended. Annually around fifty thousand tourists visit Tawang to enjoy the scenic beauty of nature like Ngurang Pass, Tsungetsar Lake etc along with doing a pilgrimage while visiting the famous Buddhist monastery in Tawang. These travellers are not only the domestic ones from within the state and across but constitute international globetrotters, Kalsi added.